Yogesh Chabria - The Happionaire ​Blog - Best Motivational Speakers In India - Inspiration, Success: Make The Most Of Now! Recently I had been extremely busy along with Aniket Waghmare and his team as we were testing unique models where we use options as a strategy as a hedge to minimize risks while investing. That has not allowed me to post here often as well as reply to comments- my sincere apologies for that. I’m sure you will understand. I don’t think we could have had a better opportunity to actually test out what all we have discovered. All the things happening around in the world make sure that the environment is as dynamic and unpredictable as possible to test out our knowledge in the practical world. A few of you might have already experienced returns in the range of 100% based on some of these ideas. Of course this is based on allotting a small part of your capital (say 10-15%) while leaving the remaining for the long term. Several times I like using a small part of my profits from long term investing for experimenting with various interesting methods and techniques of business and finance. To be honest not all are successful – but that is something I know even before I put in some money. However if things do work out, the returns are extremely high and exponential. If they don’t work out – it just means we had fun and learnt what not to do and should try more things. Fear of failure should never stop us from doing things we want to do – provided we have made sure we are not risking too much. Risking too much can lead to a situation like Lehman Brothers or Bear Stearns or the several other Investment firms in America and the West. Always make sure that you risk a very small part and never put your family and loved ones in trouble. They suffer much more when they see you in trouble. As they say impossible is nothing and we need to keep our dreams alive. Today with the fall of some of the biggest names in the world of finance and business in America, many Indians might be feeling a bit worried and hesitant. My message to all of you is that this is not our time to worry and panic – but our time to rise and shine. In fact I feel we have been given one of the best opportunities in history to grow and show the world what we are capable of. What our country needs is growth – and we are all responsible to make it happen. We need to seize this opportunity and show the world what we are capable of. In the short term, we might feel the ripples of what has happened in the West. But instead of cribbing ad getting worried, we need to think about how we can benefit and how we can learn from the mistakes of these Western institutions. China is going to be in trouble as they have large amounts of exports – we fortunately don’t and we are a domestic growth story. The fall of one empire means it is time for a new empire to rise. When the sun sets in one part of the world – it means that it is rising in another part. This is a new dawn, and even though we might have darkness for some time, soon after the sun is going to rise. Let us not worry and let us make the most of now. Based on the unique strategies we have developed we are looking at exploring business and investment opportunities with Happionaires who would like to be investors, partners and supporters. If you are interested send us an e-mail on yogeshchabria@happionaire.com to find out more. Check out an Open Letter From Grandpa For Lehman Brothers! India In The Security Council Next? This is the most sensible and logical voice I have heard till now from India. I agree that jobs will go and investments will be hit - but our nation is very underinvested. We have large savings and a huge opportunity to tape. I fully support you and your team and would love to be a part! Will surely send you and e-mail. Once again a post meant to be read by every Indian. It is high time we have faith and beilef in our own nation and people. Lovely to be a Happionaire and be with you. Would be extremely interested in finding out more Yogeshjii. I have sent you e-mail. Very motivating and inspiring post as usual! Fully agree with you, Suresh and Raj. I too have sent an e-mail and very excited!!! Keep it up. Wonderful post also on Wealth. It was great to hear about a company like DSN and reading what yo uwrite always motivates me (and millions of otherss) to move ahead in life and keep trying. Our nation has so many such companies and people - yet we want to read about bankrupt American firms. I hear GE is going down i nthe next one year. We are a great nation and should be proud of our culture and country. You aree correct this is the time to show the world our culture, economy and knowledge. Jai Hind! and Jai Happionaires! Yogesh your blog is one of the best blogs about India and business and investing. I'm from Dubai and it is amazing to know about what all is happening in India. I run a small fund and soon we are looking at allocating even more towards India. Personally as someone who is neither Indian nor Chinese - I prefer India at the moment because China is more of a bubble where government calls the shots. China could never have the type of freedom you have and I don't even read any Chinese blogs as their is a language barrier. Will drop you an e-mail and surely can do lots together. After reading one of the best books in my entire life let me also say that this is one of the most positive blogs. 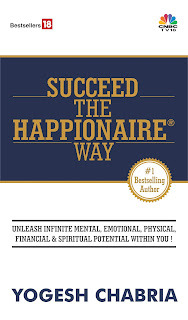 I became a big fan of your ideas as soon as I read your articles and book - Invest The Happionaire Way. A book which I have bought also for my son and father to read. I have sent you and e-mail as I'm very interested in exploring and investing in your ideas. We can have our new DSNs and other such ventures with your guidance. Let me at firstt thank you for the immense support you have been for me and let me realize how to stay calm, be patient and invest with knowedlge. I read Rakesh saying what you have been always saying that our nation has long way to go and not to sell because of West. We are India and proud of it - not west. Me too like all others is sent you e-mail as I too am on th elook for someone to invest into and do business with. Keep it up Yogeshjii and spread more happionaires! Inspirational, motivational, intellectual and very timely advice! Well Said Yogesh ... I think what has happened in the USA is indeed unfortunate, but fortunately our Banking system is strong enough to sail through this waves ... even now some quality companies are available at discount prices, provided we have the courage to do so. As they say that "Best of the investments are made during the worst of the times"
I heard abt ur blog thru one of my friend and visited this site on 4 days back ..frankly did not find it inetresting ...but ur article "Make the most of now " is sensational" .. its very positive and inspirational ... I m thoroughly impressed with the way u think n write ...m eagerly waiting for ur next blog now ..
Great idea! Have sent you an e-mail...please accept me. This isn't a blog but an entire way of life and thinking. It is lovely the way you spread smiles, motivate and help people learn. I got to read ITHW and it is one of the most superbly written books and something every Indian should read. So all my hearty congratulations Yogesh for writing one of the biggest bestellers ever till date. I'm sure millions of people would have benefitted from it. Also I would love to be a part of anything you are coming out with(hope IPO also in future) and create even more wealth. Keep it up and look forward to more wonderful inovation from your Happionaire family. Very very inspiring for a young Indian and something that makes me want to do great things for our nation. Thanks for always spreading so much positive energy in our lives Yogesh. I got the opportunity to grab a copy of Invest The Happionaire Way on SpiceJet and it is the best book I have ever read in my life. To be honest the first book I ever read of finance and investing. I'm sure you would have heard it milions of times before Yogesh - but thank you so much for educating common people like me and helping us invest better and create wealth. Just from you words I can feel your warmth, smile, positive energy and charm. I'm looking forward to more such wonderful books and things from your end. I'm sure there is much more to be heard from The Happionaire family which i'm glad to be a part of! Keep smiling and keep making millions all over the world smile. The markets have been falling like a pack of cards and we miss your insights. I am sure there are bargain deals out there that one can find right now. Other happionnaires like me surely would be interested in your views on scripts. I bought your book on SpiceJet and finished reading it. It is a great book and very relevant specially now - since stocks markets are going down. I have realized that instead of panicking and selling smart people invest in times like this. I'm sure you must be busy doing research and picking up gems in this blood shed cheap just to make a killing in the next 4-5 years. Lovely read and really looking forward to much more from you! Another of your fans and Happionaires. I read Invest The Happionaire Way and it was one of the most motivating books. Your post is very apt for today's time and for people to realize that we should not panic and try to grab opportunities. I hope more Indians read and followed it. Thanks for making us stay calm and smile and look for the longer term picture.